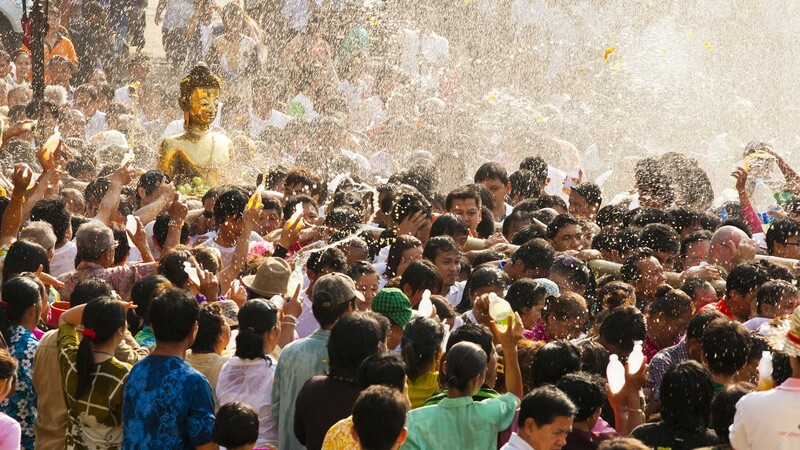 Songkran Festival is one of the biggest festivals in Thailand and the world’s friendly water fight. This traditional Thai New Year festival held annually from April 13-15(three-days national holiday) Most of Thais residents travel back to hometowns for family reunions, however, it is a good time for tourists who fly into Bangkok to enjoy one of the most colourful and festive times of the year. If you go shopping outside the hotel and taking anything outside with you, like money or your phone, you are going to get completely soaked so a waterproof bag is a must! You can buy them for around 20-50 baht in the city. To enjoy Songkran Festival in Bangkok, we highly recommend you buy a water gun. It’s more fun when someone splashes your water and then you blasting them back with a big water gun. Silom Road, the entire of Silom Road closes into a massive water fights/bars party. The tourist’s mix of young Thais and foreign travellers, lots of water fighting all day and night! Khao San Road, the road is filled with traveller around the world, the street party features lots of water, music and bars and restaurant along the road. Siam Square, if you want to shop after enjoying Songkran festival in Bangkok then you have to visit Siam Square. There are stages and activities in Siam Square, Central World, including music and cultural events. It’s time to book Novotel Bangkok Sukhumvit 20 and enjoy the memorable festival holiday, thanks to the hotel location, a few steps from BTS Asoke and MRT Sukhumvit Stations where you can connect to MRT Saladang Station and Silom Road just next to you where you can enjoy Songkran Festival in Bangkok.